We have pick out some of the best Android apps to download on your new phone, including free apps, popular Android apps and some apps you might not know. World Around Me, or WAM, is a tool for finding out about places of interest around you. Winner of the Google Play Awards ‘Early Adopter’ category, this app uses your phone’s camera to highlight local restaurants, parks, museums, cinemas, and other interesting places in your immediate area. So what exactly is the ‘Early Adopter; award? Well, according to Google it rewards adopters of a nascent technology or platform – in this case the use of a very basic augmented reality. The main feature of WAM is the ability to point your phone’s camera at the surrounding area and see small cards appear next to places of interest. The cards will include the name of the place, a review rating, and the distance to that particular location. In the top left of the screen there’s a small radar icon, with dots representing the location of nearby attractions. Point the camera in the direction of a dot, tap the card that appears on-screen, and you’ll get more information and options. Taking the app for a spin in central London, I tapped on the card for Shakespeare’s Globe Theatre for example, which would give me more information, the option to call the venue or visit its website, read reviews, or view the location on Google Maps. And it works straight away. 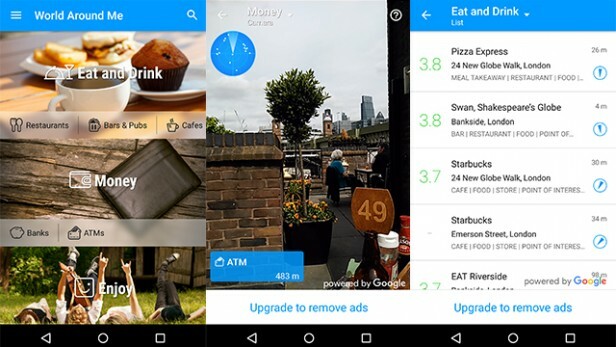 You just download the app, choose from a list of categories such as ‘Eat’, ‘Money’, ‘Enjoy’, and more, and the app will load up your camera viewfinder. That’s it, you’re ready to start finding interesting places around you. There’s also a list view for those that don’t want to use the camera, which will simply show a list of the nearest places of interest, and a map view. One of the cool features is the real-time distance indicator that appears on the various cards and which decreases the closer you get to the location. The other great thing about WAM is the sheer amount of places you’re able to search for. Pretty much anything you can search for on Google Maps is searchable within the app. There’s no question that there’s a novelty factor to WAM that some will find wears off fairly quickly. If you’re looking for somewhere to eat nearby, WAM isn’t going to offer any more suggestions than Google Maps. It’s cool to see the augmented reality view in practice at first, and for many it might prove to be more usable. But it’s essentially the same functionality you get from any map app, just implemented in a more visually striking way. You also have to pay if you want the Pro version, which gets rid of the ads and includes higher-quality photos of the many places of interest. WAM is something a bit different. It’s no more useful than a decent map app when it comes to finding local services and places of interest, but it’s undeniably cool to see even this very basic form of augmented reality working, and may even prove to be a more intuitive way to discover local hot spots for many. If you’re looking to access media stored on your computer through your smartphone, Younity might just be the app for you. Much like the popular Plex app, Younity turns your computer into a home media server, allowing you to stream movies, view photos, and listen to music through your handset without having to transfer all the files to your phone. 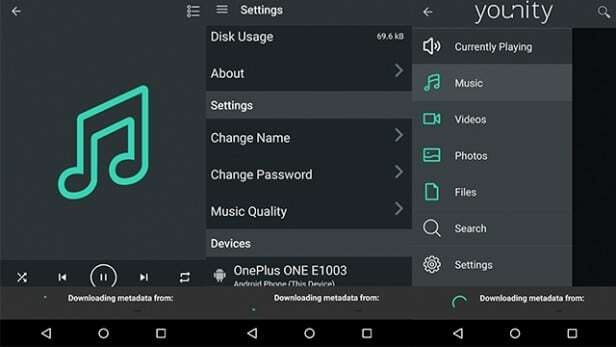 In order to use Younity, you’ll need to install the app on both your handset and your computer. The setup process on both is incredibly simple. You can download, install, and set up the app on both your computer and tablet or phone within 10 minutes. The Android app is available through the Play Store, and you can visit the Younity website to download the desktop version. You can also download Younity on as many devices as you like. Once you’ve downloaded the app, you’ll be asked to sign in with a Facebook or Google account, or sign up using an email address. I opted for the latter. After you’ve clicked the right button in the standard verification email, Younity will immediately start scanning your computer for files. Considering I have quite a large amount of music and pictures on my Macbook’s internal storage, the time it took for Younity to scan and index everything was remarkably quick. I was browsing and streaming photos and music on my phone within 2 or 3 minutes of setting the app up on my computer. 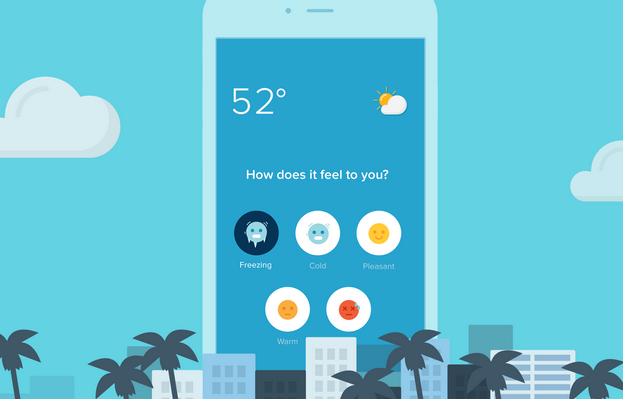 The interface is incredibly clean, while the material design elements make the whole experience distinctly familiar. Browsing through your various files is made easy with the inclusion of a menu that slides out from the side of the screen and breaks down your files into Music, Videos, Photos, and Files. You also have the option to search, which makes things a lot easier if you have a lot of files and can’t quite remember where they’re all stored. Everything is just incredibly straight forward, which is exactly what you want from any app such as this. I had absolutely no problems during setup or use. What’s more, the service is very secure. Nothing ever gets uploaded to the cloud, rather, a personal cloud is created using only the devices you sign up with, and the whole thing is encrypted. Younity also works with AirPlay, so you can stream media to your TV or stereo, plus you can upload photos to social media direct from your computer through your phone. We’re struggling to find anything wrong with this one. Not only does it deliver on its promise to allow you access to your stored media from anywhere, the whole thing is completely free and there’s not an ad in sight. The one thing that would have been nice is Chromecast support, but according to the developers, that’s on its way. A simple, easy to use service that does everything it promises. Airplay integration is great, and with Chromecast support on the way, plus the fact that the whole thing is completely free, Younity is a must-have app for anyone wanting on-the-go access to their stored files and media. When it comes to organisation apps, you’re beyond spoilt for choice. It seems like new apps offering to help simplify your life appear on the Play Store every day. Among the hordes of organisation apps however, Trello stands out as a powerful yet simple tool for planning projects. The whole thing is based around boards, on which you can make lists. You then populate these lists with cards. For instance, you might have a ‘to do’ list with several cards for each job, a ‘working on’ list for jobs you plan to work on that day, and a ‘done’ list for when you finish a job. You can then drag the cards between lists depending on their status. Trello makes it incredibly easy to start using different boards. It works best in its full desktop browser setup, but the mobile app is just as useful, if slightly more difficult to use. If you have a Trello account, you can simply sign in when you download the app and your existing boards will be synced to your phone. What’s great about Trello is that it can be used for so many things. If you want to use it simply as a ‘to do’ list with extra features, it’s great for that. If you want to use it to visualise a personal project it’s great for that too. And if you want to use it as a way of organising your team at work it’s range of collaborative working options make it the perfect tool. Despite the fact that a smartphone screen somewhat detracts from the experience by limiting your view of a board, the mobile experience is still very fluid and accessible. Tap a board, tap a list to add a card, and tap and hold to drag a card between lists. Easy stuff. You can do all the things that the desktop browser version offers, such as adding other members to a board, assigning them to cards, or tagging certain cards with colours. 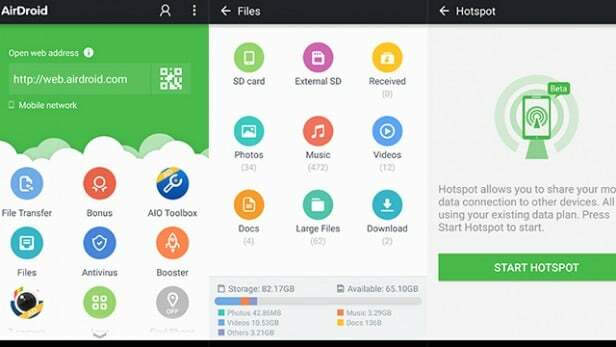 There’s also the option to attach files to cards from Google Drive or Dropbox. The app also encourages collaborative working by allowing you and other members to comment on specific cards. 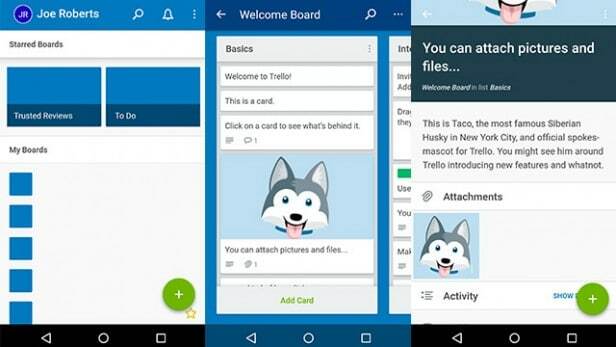 All of this is incredibly easy to do, and Trello has been designed in line with Google’s Material Design, so the user interface feels familiar. I used Trello to organise my work tasks, personal ‘to do’ items, and plan projects and found it very easy to use. I was never looking through menus for a particular option or wishing I could do something that Trello doesn’t allow. It all just works well. Not a lot really. Some reviewers have asked for better widgets, and it would certainly be nice to have a widget which shows you the status of a particular card you’ve assigned someone to. But on the whole Trello works incredibly well, and I have never encountered any issues other than when my phone has lost data connection. Trello combines ease of use with a range of extra features, making it an adaptable tool which you can use to organise any type of project you want. With a clean and intuitive UI, plus the fact that the whole thing is entirely free, there’s no reason not to at least investigate it for yourself. Any smartphone user knows that slight reductions in the amount of time it takes to carry out a task can make all the difference to the mobile experience. Launchify allows you to quickly launch your favourite apps without having to return to your homescreen or app menu. A constant notification provides you with a line of your most used apps which you can set to change based on your location. And there’s also lock screen and home screen widgets, allowing you to get quick access to your favourite apps from anywhere. It’s a very simple but incredibly useful service. Launchify begins working as soon as you download it and tap the app icon. 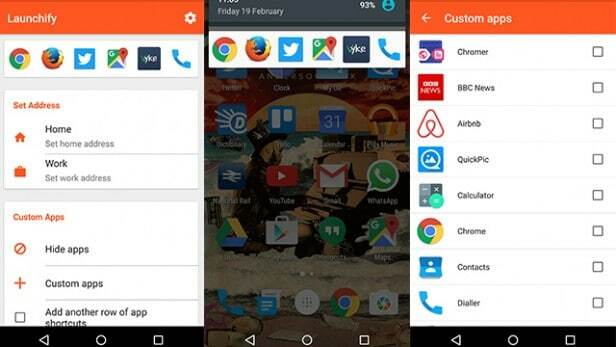 Once you’ve given Launchify access to your apps, you’ll be taken to the home screen where you can start customising. As mentioned, a constant notification, featuring your most-used apps, will appear in your notifications shade. You can customise this notification very easily by tapping on ‘custom apps’ from the Launchify’s home screen and selecting the apps you want to appear. Alternatively you can set a Home and Work address which allows Launchify to change the line up of apps in the notification based upon where you are and which apps you mostly use in those locations. It can also tell when you’re driving and recommend apps you might need, such as Google Maps. Simple but clever. And it works well. I found that Launchify did a good job of anticipating the apps I needed, although you’ll need to use it for a few days before the location service learns your habits properly. And even though the time it takes to go to one of your home screens and tap an app wasn’t ever a huge problem, the small reduction does make a difference. Swiping down from the top and then tapping an app feels intuitive and speedy. The constant notification is slightly irritating. Every now and then you’ll think you have a message, only to realise you’ve got Launchify turned on. It’s a small issue though, and you can always use the app’s lock screen and home screen widgets instead. If you want to add more than six apps to the notification, you’ll need to upgrade to the Pro version, which also allows you to manually add contacts to the notification. It’ll cost you £1.50, so it’s not the most expensive upgrade, but you might find that six apps is all you need anyway, making the upgrade somewhat unnecessary. Launchify is easy to use and allows you to access your favourite apps from anywhere. Its interface is also simple enough that you’ll be using Launchify confidently within minutes of downloading it. It’s not going to revolutionise the smartphone experience, but it’s a handy tool for anyone looking for quick access to their favourite apps. 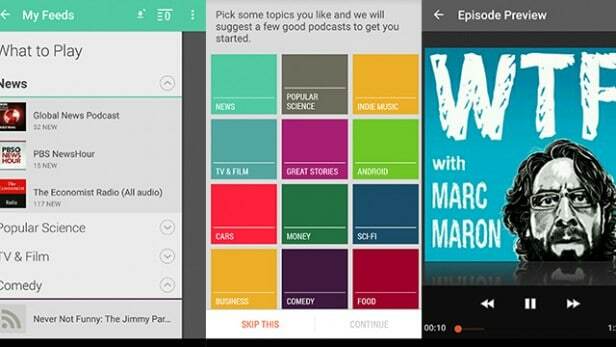 BeyondPod is a podcast player and manager with some cool extra features such as the ability to integrate with Feedly. The app contains content from both small and big publishers so you should be able to find pretty much any podcast you search for. It’s been around for a while now, but has seen a number of improvements which make it one of the best podcast apps you’ll find on the Play Store. Like any good app, BeyondPod makes it easy to get set up. Once you open it for the first time you’ll be asked to choose your favourite categories, from Comedy to News, and the app will suggest some feeds to start following. Within minutes of downloading it, I found several of my favourite podcasts and was downloading new episodes. In fact, there wasn’t any podcast which BeyondPod failed to find, from Serial to WTF. The app also creates ‘smart playlists’ based on your listening habits, although I found it easier to just navigate through my downloaded content myself. You can also easily create playlists by tapping the ‘plus’ symbol below each podcast episode, which I found more useful than trusting BeyondPod to guess my listening schedule. BeyondPod is also compatible with Android Auto and comes with playback features such as volume boost and the ability to adjust playback speed. You can also use the configurable skip buttons to quickly go back 10 or 30 seconds, or whatever you choose as the standard skip options. This is a very useful feature as the timeline indicator can often be difficult to use on a small phone screen and I found myself using the custom skip buttons a lot instead of trying to manually go back to re-hear something I missed. With the Pro version you also get Chromecast support, so you can cast video and audio content from the app direct to your TV or speaker system. When you first download the app you will be given seven days of the Pro version as a trial. That means you’ll get the Chromecast support, device synchronisation (which means you can pick up where you left off across multiple devices), and automatic downloads where BeyondPod will download new episodes overnight. After the seven day trial you’ll have to pay a pretty hefty £5.56 for an unlock key if you do decide to go Pro. There’s no obligation to do so, but considering there are other podcast apps which supply some of the Pro features as standard the price seems quite high. Still, many will find the price reasonable having got used to BeyondPod’s simple and easy playback interface and extra features. A recent update caused controversy among Play Store reviewers who say BeyondPod was easier to use before the update rolled out. The app does seem to have a lot of extra settings hidden away in various menus and at first it’s unclear whether the suggested feeds that result from your category preferences are feeds you are subscribed to or are simply there as recommendations. BeyondPod is a great way to manage and listen to podcasts. The player is simple and easy to use, there’s tonnes of content, and the extra features are genuinely useful. While the price for the Pro version is fairly steep and the home screen layout could be a little clearer, BeyondPod will not disappoint anyone looking for a comprehensive podcast manager.